How do we learn about God? In an age of competing world-views, what is the basis of the Christian claim to offer the truth about God, the world and ourselves? 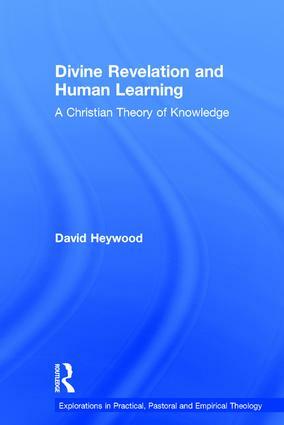 David Heywood charts a path through the study of human knowledge, showing how the insights of theology, philosophy and psychology complement and amplify one another, and bringing the experience of revelation within the scope of the study of human learning. He shows the relationship between human psychology and the work of the Holy Spirit and demonstrates the credibility of the Christian claim to a transforming knowledge of God in Jesus Christ. Offering a new model for the relationship of theology to the natural and social sciences, David Heywood shows how the claim of Christian theology to deal in issues of universal truth can be upheld. For Christian education, this book provides a theological rationale for the use of methods of teaching and learning of educationally proven effectiveness. Contents: Introduction; Knowing the world; The big picture; Thinking and feeling; Knowing the self; Theology among the sciences; The image of God; The Jesus of faith and history; Conclusion; Bibliography; Indexes. Revd David Heywood is a Church of England Parish Priest, in the UK. Theological reflection on the church’s practice is now recognised as a significant element in theological studies in the academy and seminary. Routledge's series in practical, pastoral and empirical theology seeks to foster this resurgence of interest and encourage new developments in practical and applied aspects of theology worldwide. This timely series draws together a wide range of disciplinary approaches and empirical studies to embrace contemporary developments including: the expansion of research in empirical theology, psychological theology, ministry studies, public theology, Christian education and faith development; key issues of contemporary society such as health, ethics and the environment; and more traditional areas of concern such as pastoral care and counselling.